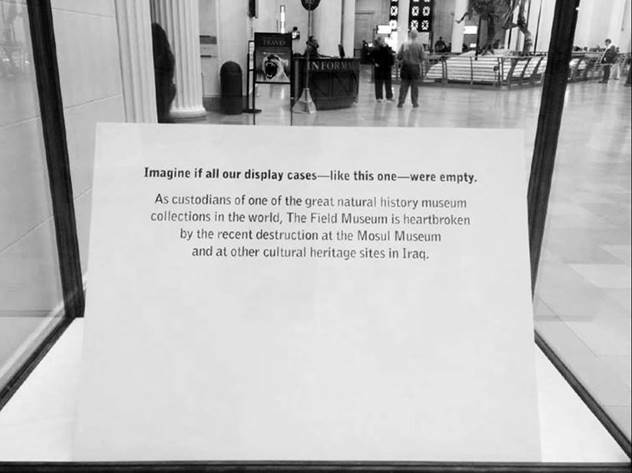 Exhibit case at the Field Museum noting destruction at the Mosul Museum in Iraq. If your organization is also responding to the destruction of museum collections and historic sites in Iraq, please share your ideas in the comments below. This entry was posted in Collections, Community engagement, Cultural diversity, Historic preservation and tagged Hatra, Iraq, Mosul, Nimrud on March 9, 2015 by Max van Balgooy.